Styrofoam is polystyrene but polystyrene is not Styrofoam. Styrofoam is coloured blue and is only used for insulation never as disposable food containers. You have committed the sin of synecdoche. If you cannot be accurate about this, I wonder what else you have been careless with the truth with. If you are sincere, please rewrite/update this article. When your saying “considered safe” does that also include being microwave safe? Very informative article……..thanks for sharing! I sell plastics for a living. Many of these post consumer recycling programs are way off the mark. Many recyclers don’t know what the hell their doing. My company recycles as a plastics compounder. We however use industrial feedstreams from various molders which are much more stable and sorted properly. Of the plastics above, I’d only be concerned with PVC or chemically known as Polyvinyl Chloride. Don’t burn PVC as it liberates hydrogen chloride gas. If you were dumb enough to burn PVC with a plastic commonly used in plumbing products called Acetal, you could find yourself creating a mini toxic explosion. Also, rigid PVC generally a little safer than flexible PVC due to the decreased use of Phalate plasticizers… Oh, by the way, many in my business who purchase scrap plastics call companies like Waste Management.. “Waste of time Management”. Their stuff is just garbage and of little value unless sorted properly. I would love to see all of this HDPE that is being thrown into land fills, be shredded and turned into 3/8″ sheeting for low cost housing. I am also looking to see if there is a pre-made machine (of if I have to build it) to turn HDPE into hollow building studs, basically a 3/8″ walled, rectangular box of almost any length you want. If you are on LinkedIn, I would love to connect. I think that you view on #7 is now outdated, and there are a lot of plastics in the ‘other’ category which are actually 100% BPA free and non-toxic. So I would appreciate it if you could maybe update this article to reflect that. Can you provide a bit more information on what ‘other” category that is 100% BPA free and non-toxic? some examples would help. Thank you! Hi, all. 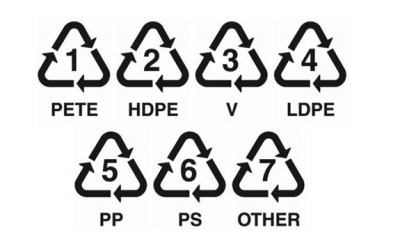 Any certificate prove LDPE is recyclable material? Styrene plastics, including styrofoam are recycled by dissolving in acetone, physically separating out the debris, then evaporating the acetone (vacuum, heat), leaving styrene again. The acetone is recycled by capturing it (pressure, cold) and recycling it to continue the process. This can be extremely economical. Natural Society…. If you look and carefully read this the wording here implies no plastics are OK to use or are generally regarded as safe according to them. There’s A Hole in The Bucket!!! Yesterday, I bought a bagpack at Wal-Mart made in China and the bag contained a dark water bottle made of recycling material number two, which smelled really bad like petroleum. Do you think that those containers are safe?. For the smell I tent to desagree. I left the dark water bottle filled with water for a couple of hours after washing it. We will see if that makes it better. #1 being bad is hooey. A few years ago Dupont had a pilot plant in Cape Fear, North Carolina for recycling PET. PET can be converted through a few chemical reactions back into the petroleum products it comes from. I red the case study as part of a Green Chemistry course. Although the process wasn’t very efficient (about 50% back converted and a lot of heat generated), last I heard several companies were investigating greener methods. So recycling #1 plastic is fine as long as the community recycling center accepts it. this information triggered me to change my baby’s feeding bottle. thanks a lot. I agree, Great information. I had heard of this break down before but there has been no reference to it for a long time. This is a great and very informative article, thank you for posting this! Thank you very much for this informations, they are gone around the globe. Thank you for sharing this information, this is a topic I have wondered about for a long time. PETE allows bacteria to accumulate? By what mechanism does HDPE prevent bacteria from accumulating? I have noticed that some hydroponic systems use pvc piping… would it be safe to eat greens that are grown in pvc holding water and nutrients?